I thought about writing a blog post geared towards new trainees, but the more I thought about the main points, I realized that most of what I wanted to convey applies to not-new trainees as well. These are the same concepts I need to preach and reiterate to myself constantly. Like so many things in life, the fundamental lessons we learn when we’re younger are just as applicable 5, 10, 20+ years later. 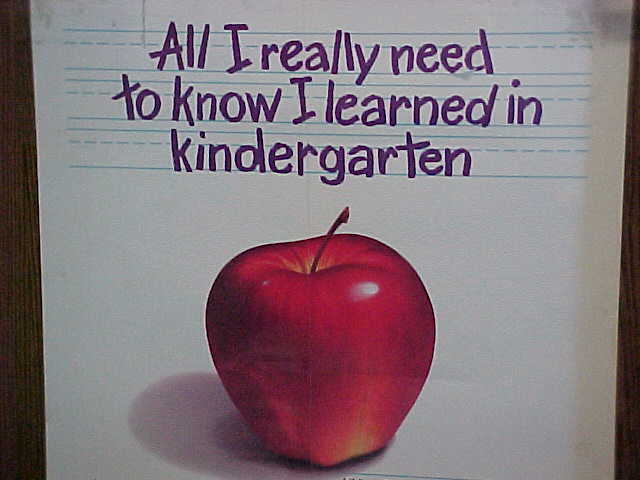 (Isn’t there some sign or motivational poster that says, “Everything I needed to know I learned in kindergarten”? It’s the same concept.) Therefore, this post is for all trainees, not just the newbies. My friend, weight training isn’t between you and So-and-So; it’s between you and the bar. Keep your eyes on your training and progress (and OFF other people). I’ll say it again, it’s between you and the bar. Performing crappy reps with a heavy load is a) going to improve your ability to perform crappy reps, b) probably result in some sort of injury sooner or later and c) hinder progress either through said injury or because crappy form will always catch up with you, and well, physics happens. The most important point is that poor form increases the risk of injury, obviously, but things like shortening the range of motion or losing optimal joint alignment, only curtail the force production potential of muscles so you end up just cheating yourself out of the gains you could make with good form. Like I tell my athletes, I’d rather so 3 almost-perfect reps than 8 poopy ones. I don’t need to rehash consistency. Patience is a virtue for a reason. Without patience it’s tempting to lose interest because you’re not seeing the progress you expect (realistic or not, more on that below). Without patience it’s easy to justify adding more weight than you can reasonably handle with good form because, well, you just want to do more weight. Without patience training becomes about the result not the process. Spoiler alert: the “result” will be fleeting and even if you achieve what you originally set out to do, you have to continue to train to maintain it…that’s how people “slip back” to where they were: they don’t have practice of the process of training. Embrace the process. As I hinted above, the strength gains and performance improvements are rarely linear. Sure, a new trainee can expect rapid growth and new PRs every week (lucky…) but once you hit a certain point, about 6 months in, that progress slows down noticeably. And if you’ve been training for a couple of years, improvements come at a glacial pace. And you know what? You’re not always going to be stronger today than you were last training session. Sometimes you stall or even backtrack for a bit, and that’s ok. Progress is not linear day to day, but the overall trend should be upwards. That’s why we need to be patient. This is another one that I need to remember every training session. Soreness and/or fatigue are terrible indicators of an effective workout. Long-term training success rests on the pillar of sustainability. If your workouts are not sustainable- meaning they leave you too wrecked to recover- you’re not going to be able to maintain your training or progress. Believe me, there is a time and place to push it hard. Fatigue and soreness are ok, but it shouldn’t be the end goal of every training session. Leaving some gas in the tank 99% of the time allows your body to recover and grow stronger. Those are some of the principles of training that never grow stale, no matter how long you’ve been training.